After a long negotiation process, I’ve joined forces with the crew at BloodyShambles.com. I’m happy to join the new club and have been promised a prominent spot in the starting lineup. I’ll continue to put in a strong effort with my new team and promise to provide plenty of subjective opinions and speculative content. Cheers! Thank goodness the summer break is over! My free time over the hiatus was filled with illness (self diagnosed as whooping cough) and a car break-in and theft of my laptop (self diagnosed as the Felony Lane Gang). Fortunately for the Eleven Match Ratings data, it is stored in a complex system of redundant hard drives and impenetrable, underground vaults, so it was never in any danger from virus or theft. Fortunately for me, the Copa America and Euro Cup provided nourishment for my weakened spirit in the three weeks without NASL football. Before we discuss the match ratings from the spring season I want to say this: Thank you to everyone who voted! It’s fun to see others participate in and enjoy something that I put a significant amount of time and effort into each week. I hope you enjoyed voting and seeing the results. 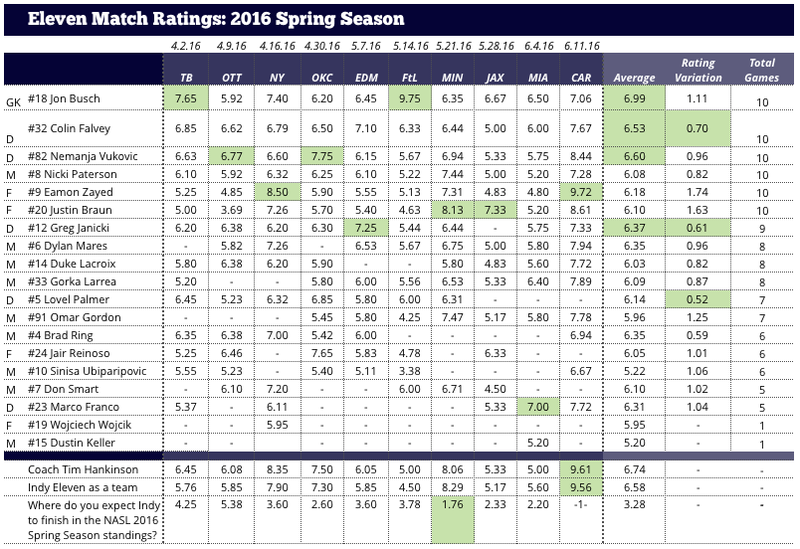 Now, let’s jump into the overall ratings for spring. If it wasn’t already obvious, the match ratings, as subjective and unscientific as they are, clearly show that the Eleven defense played THE key role in keeping Indy Eleven competitive in every match and unbeaten over 13 matches now. With a few exceptions, they’ve barely put a foot wrong, and when they have someone has been there to make a play and keep Indy in the game. Accordingly, a goalkeeper and three defenders top the list of the spring season’s highest rated players. Goalkeeper Jon Busch wins the Eleven Match Ratings Spring Season MVP award with an overall rating of 6.99. Busch received ratings above 7.00 in four matches and only once out of ten matches received a rating less than 6.00. Busch also posted the highest single-match rating of the season; his 9.75, earned in a gritty week 6 shutout against Fort Lauderdale, slightly edged Eamon Zayed’s 9.72, garnered after his three goal performance in the spring finale versus Carolina. Both were legendary displays for Indy, quite likely the two best in club history. Left back Nemanja Vukovic played well defensively but really shined getting forward and finding opportunities to impact the game offensively. The skilled Montenegrin netted two goals and two assists in 10 games, which propelled him into second place in the overall ratings. Center backs Colin Falvey and Greg Janicki round out the top four. Both also received the most consistent ratings of any player with more than seven appearances in the spring. It’s been a joy to watch Falvey organize the back line while also making a hard tackle when necessary. Janicki has proven his worth, after a tough 2015 campaign, as a no frills, reliable defender. Four players twice won Man Of The Match awards – Busch, Vukovic, Zayed and forward Justin Braun. The other two were won by defenders, Janicki and Marco Franco. Two charts below illustrate the importance that defense has played in Indy’s success. The first simply shows the average ratings of four positions – defense, center midfield, wide midfield and forward. Defenders were rated much higher than each of the other positions. Central midfield was, maybe surprisingly, the lowest rated, but not a whole lot lower than the wide midfielders or forwards. New signings at central midfield and forward should see improved play for the Eleven in two of the roles. The next chart is a line graph featuring the individual match ratings of defenders and forwards. This line chart displays the consistency of Indy’s defense across the spring season and also that the forwards, as a unit, often either excelled or disappeared. The defenders only had one “hole” where the majority of ratings were low (Week 8). The forwards have at least four holes where ratings were low. In many ways, that’s natural – it’s really hard to score goals and if a forward doesn’t score he is more likely to receive a low rating – however, it will be much easier for Indy to win more than they draw, if they can have just one forward who excels in each game. In Week 7 and Week 10, Indy scored a combined eight goals; in the remaining eight spring games they scored seven times. Two more goals across those seven games and Indy could have posted six wins from their 10 spring games instead of six draws. Two small trends I noticed appeared after midseason: One, Omar Gordon struggled a bit in his first three games as he acclimated to the team and league, but, in the four games that followed he posted an average match rating of 6.55. If Gordon could have averaged that over all 10 games it would have be the third highest rating. Two, beginning in week 8, Marco Franco replaced right back Lovel Palmer, due to injury. Franco received average ratings of 6.31 across his five appearances (three starts and two early season substitutions), and was the Man of The Match in week 9; Palmer received a 6.14 across seven appearances. A tough decision looms for Coach Hankinson in deciding upon his first team left fullback. Does he go with the Franco who is more mobile and attack minded or back to the steady Palmer, who provides more size, experience and hard tackling. There’s a lot of data here, plenty of things that I’ve surely overlooked or not covered. if you find anything interesting please share it with the community, either as a comment below or at the Indy Eleven subReddit.